Charles Phoenix has a crush on Los Angeles, and l.a.Eyeworks has always had a crush on Charles. 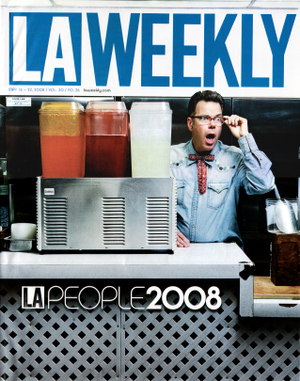 Now the L.A.Weekly does, too! Phoenix graced the cover of their annual “People” issue wearing his beloved l.a.Eyeworks Harry frame. His recent roller rink extravaganza shows were a sold out smash and we can’t wait for more! If you like your nostalgia pie like we do (with a big dollop of kitsch on top, that is), sign up to receive Charles’ “Slide of the Week” e-mail or visit his website to check out his notorious appearances on Martha Stewart.